Watch as your favorite characters come to life as gigantic, helium-filled balloons float down the streets of America’s Thanksgiving Parade at Detroit. Booming marching bands and flamboyant floats flood the streets with holiday cheer. Street performers and entertainers bounce around in their uniforms. Idols like Elmo, Ronald McDonald, and even Santa Claus are sure to be present at this year’s parade. This is one of Michigan’s most famous holiday occasions that really screams “spectacular”! This event is fun for people of all ages and kid appropriate. Hosted by Art Van, the parade will occur on November 26, 2015 at 8:50 a.m. Native Michigander Tim Allen will serve as the Grand Marshal for this year’s parade. He will be a part of the Thanksgiving parade, along with Olympic gold medal winning ice dancers, Meryl David, and Charlie White, Congressman John Dingell and Debbie Dingell, Bill and Lisa Ford, Art Van Eslander, and many other notable people. America’s Thanksgiving Parade 2015 theme is “So Happy Together”. 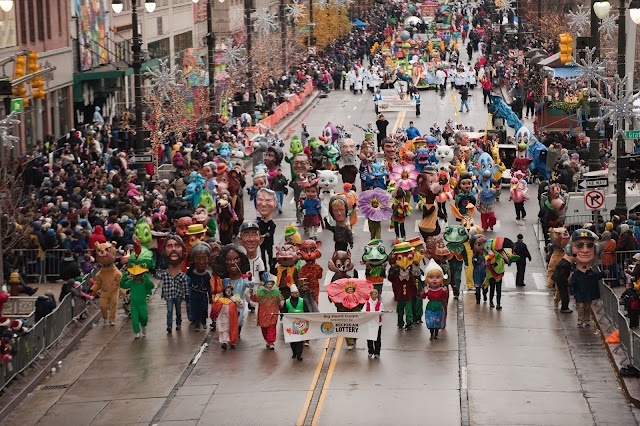 The event has been honored as one of the best Thanksgiving parades in the United States by U.S. News & World Report Travel. The parade will surely blossom holiday spirit in all of those who visit. Take your kids, families, and friends to this parade and just be happy. Visit the America’s Thanksgiving page for more detail.